[The Monthly Political & Economic News] JMS President, Jung Myeong Seok’s case: Is this a social issue or a religious issue? Due to a certain press conference and some news reports from ex-members of the Christian Gospel Mission (CGM; President: Jung Myung Seok), past incidents related to CGM have once again been brought into the spotlight. This so-called JMS Incident was covered by the media after receiving reports from an anti-JMS organization in 1999. It came to prominence as a social issue and was concluded after President Jung received a 10-year sentence on April 23, 2009, following a 10-year legal battle. Since November of last year, ex-members of CGM have created an organization called JMS Damage Control Group (hereafter DCG), and are once again trying to bring the JMS case, which had faded away, back into the public eye by demanding group compensation from CGM and President Jung. Due to false reports in the media, CGM is mistakenly known as JMS to the public. JMS is an acronym for Jesus’ Morning Stars, symbolizing a movement of faith to become Jesus’ morning stars, and is not actually the organization’s official name. In this article, CGM will simply be referred to as the Mission, but will be written as JMS when needed in context. Due to false reports from the media, CGM is mistakenly known as JMS to the public. JMS is an acronym for Jesus’ Morning Stars, symbolizing a movement of faith to become Jesus’ morning stars, and is not actually the organization’s official name. In this article, CGM will simply be referred to as the Mission, but will be written as JMS when needed in context. DCG’s claims are almost identical to anti-JMS’ claims that were made in the past, with two main claims. The first claim is that President Jung systematically took sexual favors as bribes from his aides and that the sexual crimes are still happening. The second is that President Jung systematically incited members of the Mission to commit acts of violence against dissenters and is instigating acts of violence even in the present. DCG has been raising the public's perception of the case as a social issue through media reports as well as through protests demanding group compensation from the Mission. However, because the Mission has not yielded to them, they have been pressing multiple charges, accusations and petitions. On the other hand, a few media outlets that had previously reported DCG’s claims have corrected inaccurate reports. One media report had uncritically re-stated DCG’s claims, which reported that President Jung who is in prison had been committing sexual crimes in the present. Later, they fixed the report, expressed regret and apologized for defamation. At present, it is only a few Christian media outlets that are the primary reporters of these issues. It appears that major media organizations are wary of paying attention to the trend to popularize the issue. This is because there is no clear evidence to support DCG’s claims, and a few contradictions have been noticed. This is one of the reasons why, when the Mission filed a lawsuit against DCG to compensate for damages and requested SBS (Seoul Broadcasting System) -- which has been reporting about the JMS case since 1999 -- to redact their broadcasts, the court recommended that SBS reconcile with the Mission and ordered them to compensate the Mission for the damages they had caused. 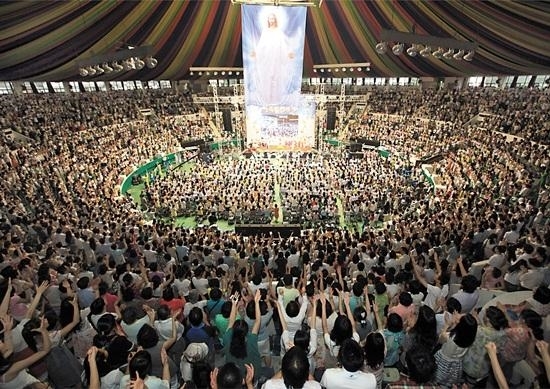 ▲ After President Jung was sentenced to 10 years’ imprisonment, the Mission started the Heavenly Holy Spirit Movement in May 2009, which is a movement of faith to put ‘Jesus Christ as the top priority in life.’ It helps people to overcome difficulties and has become a new source of revival. Several journalists have exposed the fact that Kim Jin-hyung (pseudonym), a DCG representative, was sentenced to 18 months’ imprisonment and has been put on probation for three years for fraud, raising suspicions that he forged a certificate of ordination as a pastor from the Orthodox Christian headquarters. These articles even warned people not to align with Kim's herding of public opinion. A DCG representative, Kim, has been reporting, since February his claim that he has been stalked and threatened with acts of violence. He accused President Jung of instigating murder and reported the alleged stalkers to the Namyangju police. However, his appeal was dismissed, and the investigation was closed on April 2. 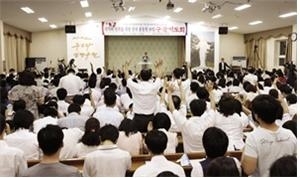 ▲ CGM members plead about Korea’s crisis to God during a save-the-nation prayer meeting, following President Jung’s teaching to plead only to God whenever they encounter difficulties. The Mission, which has once again encountered a crisis after President Jung’s imprisonment, are setting a 70-day prayer condition following their 40-day ‘Esther Prayer’ condition from March 1. However, it was disclosed in court that Lee’s actions, whom Mr. Min had cited as proof, were of his own volition, not on President Jung’s orders, and that Mr. Lee had already finished his two-year sentence, which was handed down on July 20, 2006. At that time, Kim Do-Hoon (pseudonym) and the accusers, who were the forerunners of anti-JMS activity, also had submitted a petition to the court to find out who was behind Mr. Min’s assault case. Another member of DCG, Mr. Jang, caused an uproar when he staged a one-man protest stating that his two daughters had run away from home and were attending the Mission’s churches. While failing to follow the proper protocol, the Christian press made a one-sided report of Jang’s claim to have been assaulted by a group in the Mission. The result: another false report the Mission has to clear up. ▲ There is evidence that an anti-JMS organization has been demanding money from the Mission and President Jung while herding the media with distorted and biased reporting through the press since 1999. It is said that even though for nearly ten years, President Jung has been countlessly accused and charged, he has never once accused or filed charges against the opposing party. However, contrary to Jang’s claim, his two daughters had been living with him and his wife for the past two years. The two daughters said, “Because a DCG representative, Kim, stirred up our parents, they even quit their jobs to focus on protesting against the Mission.” They pleaded, “Since we are not attending church anymore just as our parents wanted, please help us put an end to their protesting and help us recover our family’s harmony.” In 2010, Jang continued to stage one-man protests, claiming that his daughters had run away from home because of JMS. However, police investigations revealed that actually, the daughters had run away from home due to domestic violence perpetrated by their father, and because of attempts to force their conversion. The daughters even sought protection at a shelter for women. The Mission has disclosed that Jang has been posting provocative pictures and text around private educational institutes where many young students come and go and where he staged his one-man protests. In addition, he received complaints from residents for making profane and insulting remarks to passing women, such as, “You’re a prostitute, right? How much did you sell your body for? You filthy b****!” The police responded to one such report about Jang. The Mission has further disclosed that at that time, Jang had a skirmish with two female members from the Mission in front of other pedestrians and police officers, but there was never any physical fighting or assault. The Songpa police are currently investigating this case. DCG uses provocative claims to generate gossip and attract public attention. However, their claims appear to lack concrete evidence. 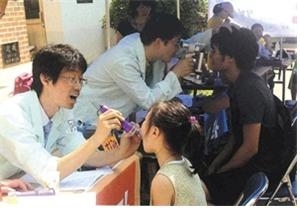 Even though the legal battles are in progress, it is not known whether DCG will be successful. The Mission, however, is concerned about a repeat of the past, where anti-JMS organizations influenced President Jung’s trial by herding public opinion without any evidence. The Mission’s position on President Jung’s trial is that the decree was unjustly made due to the false reports from those opposing the Mission, with the goal of obtaining money. It seems money is the cause of the conflict between DCG and the Mission. DCG’s position is that because President Jung has been deemed a criminal by the Supreme Court, he should return the offerings they had made while being deceived and should compensate them for their losses. However, the Mission’s position is that most of the former members who want compensation continued to diligently attend church even after President Jung’s trial, and that it is unreasonable for them to claim that they were deceived now, three years after Jung’s trial. 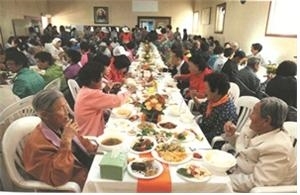 ▲ The Mission holds a feast in the Wolmyeongdong Retreat Center in honor of the elderly. The members of the Mission live a strict, moral life and have been doing community service activities for the last 30 years following the teachings of the Bible. According to the Mission, a DCG representative, Kim, has significant debts. They think that is why he is spreading false claims, taking advantage of the fact that President Jung is in prison, and is plotting to resolve his money issues using the media as his weapon. Actually, Kim promised his debtors that he would repay them and even wrote an agreement to drop charges against the Mission last year on October 12, in return for hush money. Kim was quickly arrested under charges of blackmail, extortion and defamation on April 20 and is now under investigation by the Gwangju Bukbu Police. Following revelations that anti-JMS organizations demanded money during President Jung’s trial, some have indicated that a retrial is necessary. 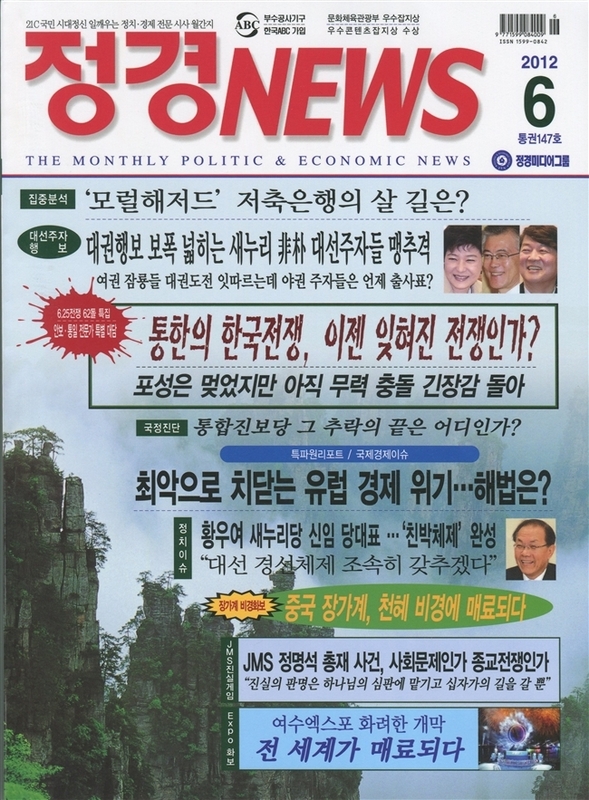 In February 2010, several media outlets publicized video footage of anti-JMS leaders, revealing that they had demanded two billion won (1,800,000 USD) from the Mission on November 17, 2005. 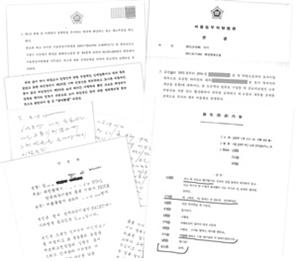 They also published the anti-JMS leaders’ letter of self-reflection written on November 15, 1999 and their letters of apology to the Mission, written on March 17, 2005 and July 21, 2005. 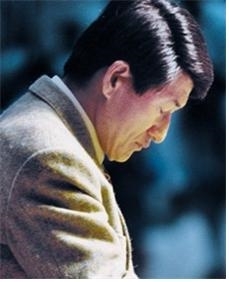 When negotiations with Kim, who had demanded money from the Mission, broke down, he called a press conference on April 18, 2006, using the women who claimed President Jung had harmed them in China. The media scrambled to report that President Jung was guilty of sexual assault in China and was bringing shame to Korea internationally. Due to anti-JMS reports, President Jung was arrested in China, held in secure custody, and repatriated to Korea. In the end, President Jung received a 10-year sentence despite the conflicting testimonies of each side, and without any objective evidence. The verdict came down to the free evaluation of the judge, due to the absence of definitive evidence. Is the JMS case a religious battle caused by religious reformation? ▲ The Mission’s medical corps provides free medical treatment to remote mountain areas that do not receive medical treatment or have disability facilities and nursing homes. The Mission’s doctrine, which runs contrary to some Christian teachings, has generated controversy from the very beginning of its missionary roots until now. The doctrine that is the source of the most conflict is The Theory of the Creation and the Fall. The Mission interprets the Genesis account of Adam and Eve eating the fruit of the knowledge of good and evil as their committing a sexual sin. The theory states that a man and a woman should love God as their first priority, grow according to the law of creation, and then have sexual relationships after marriage, but Adam and Eve violated this principle, so they were punished. With this fundamental doctrine, the Mission has insisted on teaching chastity until marriage. Currently, Christianity interprets the fruit of the knowledge of good and evil as a literal fruit or compares it to different parables, but their teachings are not unified. 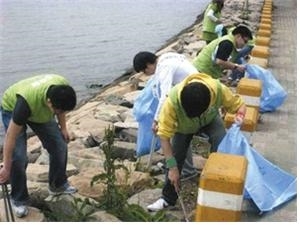 ▲ With the mentality that the earth is God’s garden, the Mission participates in cleaning litter and beautifying the city’s landscapes by doing things such as removing oil from the coastal waters of Tae-an. 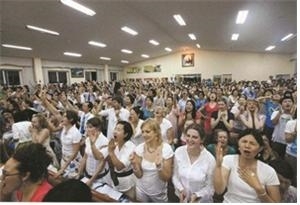 ▲ Churches from 50 nations around the world participate in a live Heavenly Holy Spirit Movement. Under the name of Jesus Christ, the working of the Holy Spirit that transcends national boundaries is taking place. 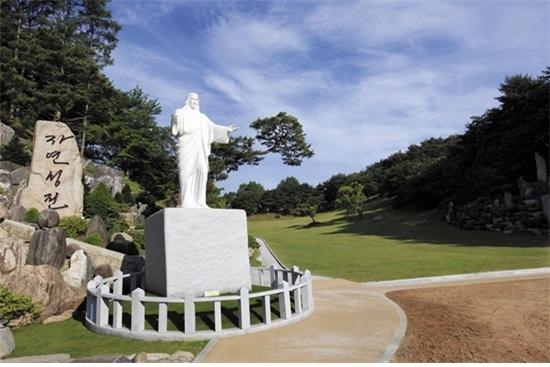 ▲ Wolmyeongdong the Natural Temple in Geumsan, Chungnam, is where the Mission’s headquarters is located. The idea of making a space where tens of thousands of people can offer service on grass and rocks without buildings shows the revolutionary disposition of the Mission.